Take that international shark fin trade! China’s biggest shipping line, Cosco, has recently pledged a total ban on the transportation of shark fin and shark fin related products. Cosco Shipping is the world’s fourth-largest container operator with 7.7 per cent of market share. This change made by Cosco now brings the number of shipping companies not accepting these products to 68 percent. This welcomed move all came to a point when 880kgs of hammerhead shark fin, an endangered species, was discovered on board a Cosco vessel arriving from Panama. This prompted WildAid, a U.S. based wildlife conservation group, to contact Cosco, urging them to follow their industry competitors by acting legally, ethically and morally by banning the transportation of shark fin and shark fin related products. Hong Kong accounts for 50 percent of the global shark fin trade annually, according to WWF data. Did you know that of that 92 per cent of the shark fins are imported via sea freight? Government data shows that between 2010 and 2015 the amount of imports fell 42 per cent. 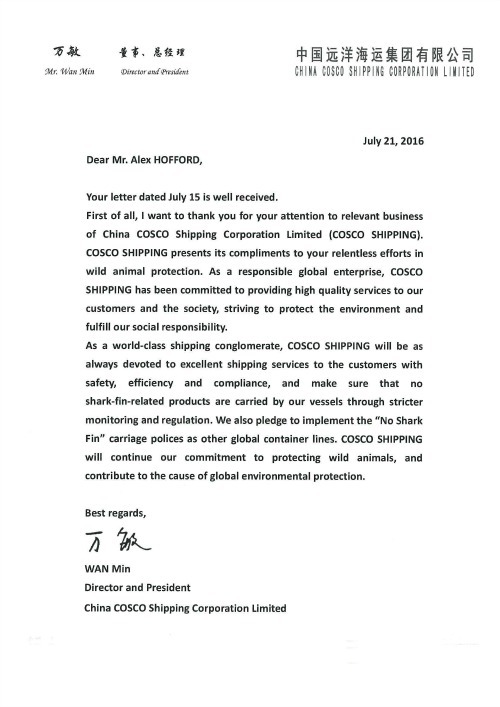 WildAid’s Alex Hofford praised Cosco’s swiftness in implementing the “No Shark Fin” rule. “They listened with great care to the concerns of the public, and reacted quickly to the very real threats of shark extinction we described to them, for which we applaud them to the highest degree,” he said. 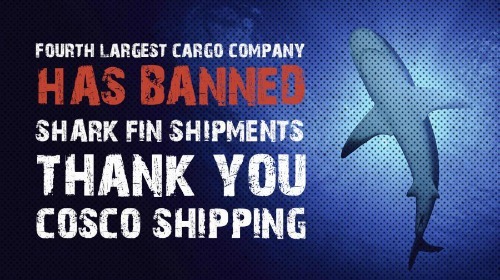 Earlier this year shipping lines OOCL and MSC joined the no shark fin embargo.